When Marcelo Bordon, Stuttgart's Brazilian centre-back, was sent off for a professional foul on Stan Petrov during Celtic’s run to Seville, he did something remarkable. He knew as the last man he’d have to go and despite this he took the time to shake the hand of the Referee who sent him packing. It not only signalled that the decision was correct, it also showed the respect the official, Pierluigi Collina of Italy, was held in by players of that era. It’s true to say that officials in Scotland have rarely been afforded similar respect. Collina used common sense and a sound knowledge of the dark arts he saw in Italian football every week to get decisions right on the vast majority of occasions. That common sense is sometimes lacking here in Scotland. A case in point being the occasion when John Collins scored for Celtic in a heated Old Firm game in the early 1990s. As Celtic players celebrated at the old Jungle, the Referee allowed Rangers to kick off. With most of the Celtic team off the field it took a good Pat Bonner save to avert a goal. Decisions like that by a Referee can be looked upon as criminally stupid in such a game. Some saw it as bias. 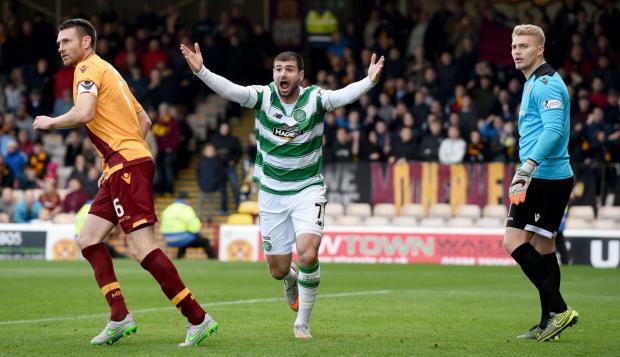 This weekend saw Celtic win 1-0 at Motherwell in a match they dominated from start to finish. However the chatter about the match focussed mainly on the contentious decisions of Referee Alan Muir. His failure to award two stone wall penalty kicks was at once astonishing and baffling. He might be forgiven for not booking Stephen Pearson for a late tackle which would have receive a yellow card on 9 out of 10 occasions but penalties change games and he got two big decisions wrong. Had Celtic lost a late equaliser the bewilderment of their support could well have turned to anger. 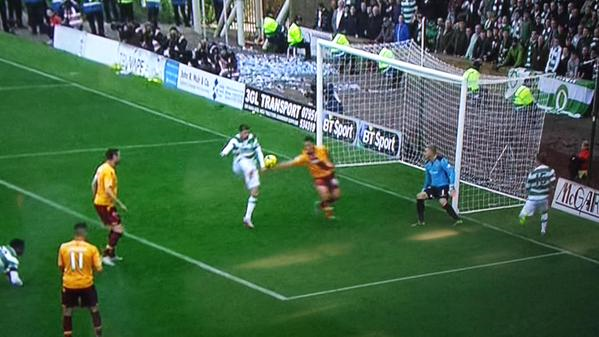 Having watched Celtic for many years now, I’ve seen decisions ranging from baffling to inexplicable. I’m not given to conspiracy theories but neither do I fall for the ‘it’ll even itself out over the season’ mantra. I have refereed schoolboy games and know how fast things occur and recognise the difficulty in getting every decision correct. But then modern Referees in the professional games have the support of eagle eyed linesmen. When I was a kid my old man would ask who the Ref was for a given big game and his reaction would always be of interest. If the reply was ‘Bobby Davidson’ or ‘Mr Tait’ he’d shake his head and say, ‘We’ll get nothing off that clown.’ That inter-generational passing on of suspicion of officials is something many Celtic fans will recognise but is it fair? 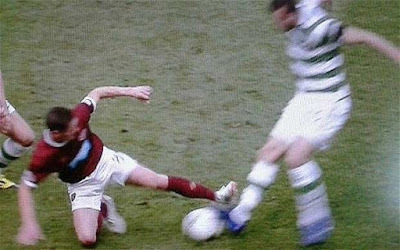 Were some referees really anti Celtic? More importantly, are some still anti-Celtic today? Those of us versed in the ways of Scottish football history can point to moments which seemed to confirm our suspicions about the club’s less than fair treatment at times. The ridiculous threat to throw Celtic out of the league for flying the Irish flag at Celtic Park was one such moment, as was the appalling and unjustifiable hold up in registering Jorge Cadete by Jim Farry. In more recent times our Refereeing fraternity has been embarrassed by the ‘Dougie, Dougie’ affair when an official resigned after admitting dishonesty with regards to the reasons he changed his mind about a penalty award at Tannadice. There was further embarrassment when Hugh Dallas resigned following his involvement in sending an insulting email about Pope Benedict just before his visit to Scotland. Surely in the parochial atmosphere of Scottish football he should have had more sense? That being said, anyone who seriously seeks to point to organised refereeing bias in the modern era when cameras pick up every incident is skating on thin ice. In the fast paced, hurly burly of modern professional football it is easy for a Referee to miss or misinterpret an incident. They seem to get little support from assistants at times, even in European ties when there are extra eyes behind each goal. Added to this there is the constant cheating by players seeking to gain an advantage. Diving is endemic and players try to influence referees by any means they can. It is understandable that they make errors and most supporters understand this. Motherwell defender stops a cross reaching Ciftci by sticking out an arm and handling the ball. Decision-Play on. 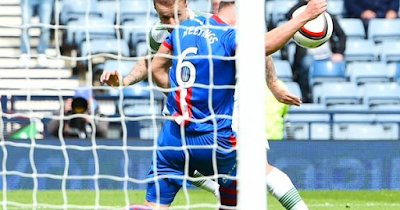 Inverness defender stops a goal bound header with his hand. Decision-play on. Ian Black of Hearts goes over the ball in a violent and reckless manner against Joe Ledley. Ledley is lucky to escape serious injury. A clear red card offence. Decision- Yellow Card. Kirk Broadfoot engages in blatant simulation at Celtic Park. The Referee, who was not even looking at the incident, awards a penalty. 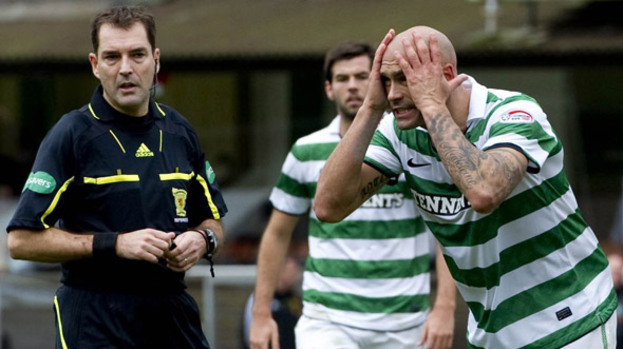 Anthony Stokes is tripped in the final minutes of the league cup final. Decision-play on. Hearts player fires a shot at Joe Ledley from 2 yards. It ricochets of Ledley and strikes Wanyama. Despite neither player ‘deliberately handling the ball’ as the rules demand, a match winning penalty is awarded. These are big calls in big games and Celtic seldom seem to get the rub of the green. I don’t subscribe to the more outlandish ideas of conspiracy but there are certain individuals who seem at the moment of decision disinclined to give Celtic the benefit of the doubt. I’ve become like my old man when I see certain individuals are handling Celtic games and find myself mumbling… ‘We’ll get nothing off that clown.’ I’m often right.